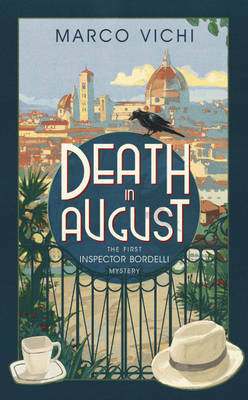 DEATH IN AUGUST is set in Florence, 1963 during a very hot August. Inspector Bordelli has stayed behind in the deserted city where residents have fled to the coast and other holiday destinations. He is alerted to a potential crime scene when the companion of an elderly woman cannot contact her employer even though her bedroom light is on. Bordelli discovers the woman, dead in her bed. Though the woman suffered from asthma, the circumstances point towards foul play. When Bordelli learns that the woman was wealthy and that she had two nephews, who believed they would inherit, he focuses his investigation on them. Bordelli is assisted by the Sardinian Piras, whose father's life he saved in the war, plus Diotivede, the crusty, elderly pathologist. DEATH IN AUGUST is a short book, with no chapters, and it is fairly light in detection however it is heavier in atmosphere and replete with unusual characters. As is apparently typical of Italian crime fiction, special attention is paid to food. Bordelli has his favourite restaurant where he sits in the kitchen with the shortest cook in Florence. Bordelli is a bit of a rebel police officer who routinely lets off those others would call criminals - those stealing to feed themselves or family - and one of those "miscreants" cooks a fine meal for Bordelli and friends at which a crucial clue is revealed (after several war stories). Other than a jarring episode where Bordelli reminisces about a maid taking sexual advantage of his very young self, DEATH IN AUGUST is a fairly cozy and pleasant read and the final solution to the death is quite ingenious but, though it's early days yet for the series, I don't think it will challenge Camilleri's place in UK hearts. Nonetheless I look forward to the next one, DEATH AND THE OLIVE GROVE, which is to be released in January. As with Camilleri's books, in addition to his excellent translation, Stephen Sartarelli provides some notes at the back.